Start the engine and keep it running at 5 000 r/min with the dimmer switch turned hi position. 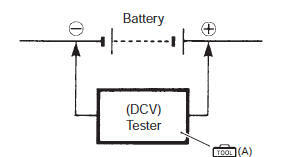 Measure the dc voltage between the battery (+) and (–) terminals using the multi-circuit tester. If the voltage is not within the specified value, inspect the generator and regulator/rectifier. Refer to “generator inspection” and “regulator / rectifier inspection” . when making this test, be sure that the battery is in fully charged condition. Install the front seat. Refer to “exterior parts removal and installation” in section 9d (page 9d- 6).